that the woman confessed to participating in her daughter, Neesa Gopaul’s murder, maintained that her statements are true and accurate. This came even as she was subjected to a series of questions from the Defence, yesterday. De Nobrega who is also known as Simone King, was among two final witnesses to testify in the trial for which Bibi Shareema Gopaul and her lover, Jarvis Barry Small, are facing an indictment for the murder of 16 year –old Queen’s College student, Neesa Gopaul. 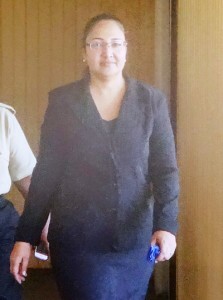 Small and Bibi Shareema are on trial before Justice Navindra Singh and a 12-member mixed jury for the murder which occurred some time between September 24, and October 2, 2010. The team of lawyers representing the two accused persons comprises Glenn Hanoman, Bernard De Santos SC, Lyndon Amsterdam, Zanna Frank and George Thomas. The case was presented by State Attorneys Diana Kaulesar, Stacey Goodings and Mercedes Thomas. De Nobrega returned to the stand to continue her cross examination. in her that she sat and watched as Small first strangled and then bashed her daughter’s skull before disposing of her body in a creek on the Linden/Soesdyke Highway. The victim’s five-year-old sister, De Nobrega said, was sleeping in the car while Bibi Shareema remained unmoved, even as her daughter begged for her life. De Nobrega said she met and befriended Bibi Gopaul during a period of incarceration at the East La Penitence Police Station lockups. 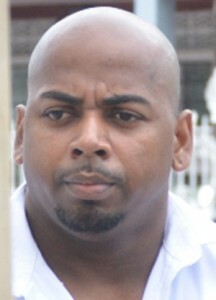 Yesterday, De Nobrega faced a series of questions from Defence Attorney, George Thomas. Thomas inquired from the witness her reason for being in the East La Penitence lockups in October, 2010. The witness said that she was incarcerated on 24 counts of fraud-related charges. The Attorney then suggested to the witness that given her criminal background it would have been difficult for persons to believe her story. Thomas then noted that De Nobrega never gave the police any proof of any conversation she had with his client. “I am suggesting to you…that you have no proof. It is your word against hers,” Thomas said adding that his client never told the witness such things. In response, De Nobrega said that police never asked her for any evidence and she therefore didn’t offer any proof to them. The lawyer then inquired from the witness whether she gave the court an accurate and complete account of what transpired between her and the accused. De Nobrega said that it was the truth to the best of her knowledge maintaining that Gopaul had indeed confided in her. The witness also accepted that there was an issue between her and the accused after she related to the police the information she obtained about the murder. De Nobrega had earlier admitted that she surrendered to the police after she had absconded after she was sentenced in absentia. She was sentenced to serve five years for obtaining credit by false pretence. De Nobrega claimed that she received threats from persons who claimed that they were linked to Neesa Gopaul. The witness also claimed that she feared for her life because Bibi Gopaul had someone place a razor blade in her (Simone’s) food. As such, Thomas suggested to the witness that she surrendered to the police with the hope of getting time off her sentence. “I am not doing this for anything sir… I am doing this because it is the right thing to do and because I believe Neesa deserves justice, not because the state promised me anything,” De Nobrega replied. The lawyer then noted that there are a number of inconsistencies in the story De Nobrega gave to the Judge and Jury in comparison to her initial statements in the Magistrate’s court. In response, the witness explained that in the Magistrate’s Court her statement was obtained after she was asked specific questions but that in the High Court she is telling the story to the best of her knowledge. De Nobrega also maintained that although she could not recall the sequence in which the story was told, she was telling the truth. The lawyer suggested to the witness that she wanted to be seen with his client, while she was in the lock ups because she would later say that the accused told her certain things. In reply, De Nobrega said that she had been at the lockups because she was granted bail but was waiting on her mother to accumulate the money. Assistant Superintendant of Police, (ASP) Denise Griffith-Jacobis also testified yesterday. ASP Jacobis related that in October 4, 2010 she was the officer in charge of the East La Penitence Police Station when Gopual, whom she identified as the female sitting in the prisoners’ dock of the courtroom, was taken to the said station pending an investigation into an allegation of murder. The witness noted that there were other prisoners at the lock ups but that on October 5, 2010, Simone De Nobrega was taken into the Station. De Nobrega, she said was a prisoner on remand; she came from the New Amsterdam Prison facility. Griffith subsequently told the court that on October 10, 2010 she received a call from the then Police’ A ‘ Division Commander, George Vyphuis. She said that the Commander told her something and as a result of what he told her she went to the East La Penitence Police and caused the female adults to be placed in a cell and secured it with a padlock. Jacobis later clarified that she was instructed by the Commander to secure the lock ups because there was a plot by some of the inmates to escape. The witness recalled that both women were in the lock ups (Gopaul and De Nobrega). She said that Gopaul was removed from the station but when she returned she was placed in a cell with De Nobrega; no one else was there. The witness related that the two women remained at the station until October 20, 2010 when Gopaul left for the New Amsterdam Prisons. Under cross examination the witness noted that it came to her attention that De Nobrega was saying certain things against Gopaul but that she received no complaint with regards to the issue. She also accepted that she never heard of any recording of a conversation between the two women. In response to questions by the State, Jacobis recalled that the women had to be separated. Gopaul was placed at the East La Penitence Station while De Nobrega remained in custody at the Beterverwagting Police Station. Jacobis is the last of 26 witnesses to take the stand. Following the officer’s testimony, Prosecutor Diana Kaulesar indicated that the State has closed their case.